Union Square is super convenient for meeting people for lunch but not overflowing with great spots to do so, unless you happen to like old, down and dirty bars, which we do. Intrepid reporter-producer Victor, from Time.com, is writing a story about the worth of having lunch and asked to talk to us about lunch, over lunch. Which, of course, we quickly agreed to. Because we love lunch and all. 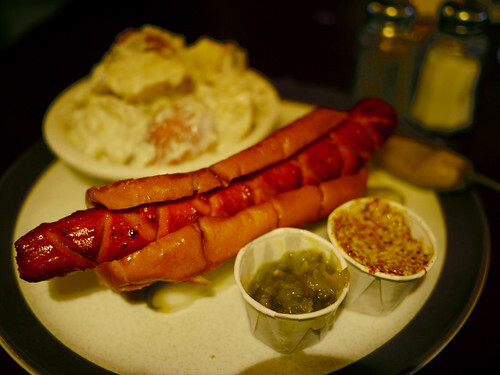 And after the last meal at Old Town where I coveted M's hot dog, I was dying to have one. I'm pretty sure it's one of the best bar hot dogs around. It's because they butter and grill the sandwich roll. And everyone knows: Butter Makes Bread Better.